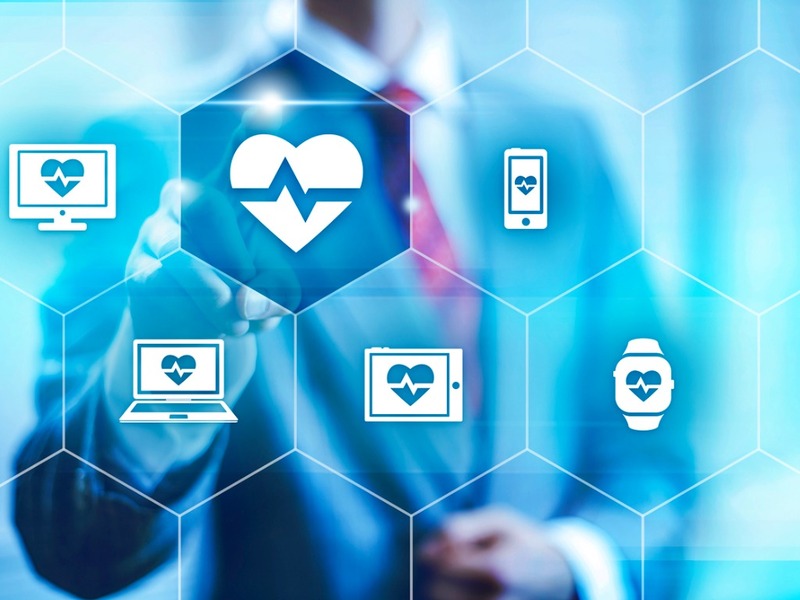 Later this month some of the brightest minds in health care tech will be gathering at Arizona State University’s Downtown Phoenix campus for Hacking the Human: Digital Healthcare Solutions Conference and Health Expo. Rick Hall, director of Health Innovation Programs, clinical professor, director of the HEALab and presenter. James Bates, CEO AdviNow Medical and presenter. Joe Hitt, CEO GoX Studios, Army veteran, ASU graduate and presenter. Question: Who should attend this conference and why? Rick Hall: This conference is designed to include ASU students, faculty and community members. While many of our attendees are coming from ASU, about half of the participants are coming from health technology companies and medical care organizations. The doors are open to anyone interested in health innovation and technology. Q: Tell us a little bit about what you’ll be presenting and demoing at the conference? James Bates: Health care is in crisis. Everyone is unhappy. Patients, doctors and hospitals. Automation is the only way to create a scalable medical system. AdviNow will be presenting the world’s first fully automated medical visit and why it works! We will be demoing the platform for students to see. Joe Hitt: I will be talking about wearable robotics, wearable sensors and human performance. I’m hoping my presentation will show people that wearable robotics will be transformative. A small amount of technology layered in the right place and in the right way can augment human performance in amazing ways. Q: Is there something you’re really looking forward to at the event? Bates: I am excited to be connected to ASU and participate in the HEALab. Creating a deeper engagement with students and faculty is going to be fantastic. Hitt: I am looking forward to meeting with and hopefully inspiring students from health and human sciences to consider working in my field. We need them in wearable robotics! Engineers can’t do it alone, not with technology that is intimately attached to the human body. Q: How important is it for CONHI/ASU to not only be participating but leading these health innovation and solutions conversations? Hall: Technology is disrupting health care in exciting ways, and the pace of change is accelerating. ASU leads the nation in innovation and the College of Nursing and Health Innovation is a leader in innovative health care education. We have the first and largest Master in Healthcare Innovation program in the country and the first and only Bachelor of Science in health entrepreneurship and innovation. Our students are the future leaders in health care delivery and technology. Bates: No one invents in a vacuum. The only way to move forward quickly to define the future is to meet and collaborate. ASU is doing a fantastic job taking the lead to make this happen. Hitt: Hacking the Human serves an important purpose given the ever-increasing need. The most efficient way to do this is to bring the brightest and best from different points of view to tackle it. I am especially excited to hear from the students as they won’t be weighed down by conventional wisdom and they embrace what’s new and different. When: 10 a.m.–4 p.m. Friday, Nov. 30, 2018. Where: A.E. England Building, ASU Downtown Phoenix campus. Details: ASU students, staff and faculty free with registration. $25 for the general public. Registration required. Robots are increasingly at work on land, at sea, in the air and out in space. 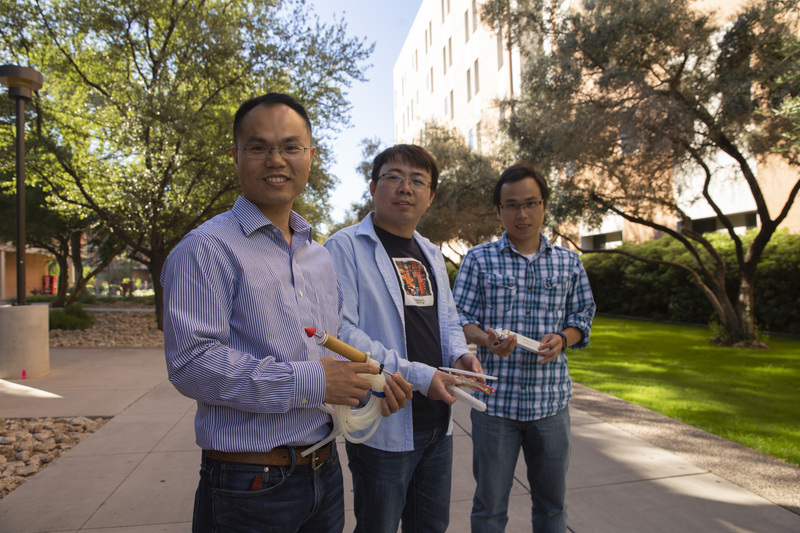 Three Arizona State University engineers are now setting the stage to deploy robotic mechanisms in what might be the toughest environment the technology will encounter: underground. Tao has earned support from a National Science Foundation Early-Concept Grant for Exploratory Research Signals in the Soil award to develop “paradigm-shifting platform technology” for “self-boring robots” from which the next generation of underground wireless sensing networks can be launched. Tao is teaming with Fulton Schools Assistant Professors Daniel Aukes and Hamidreza Marvi to devise approaches for modeling, designing, prototyping and defining the essential technological characteristics of such networks using bio-inspired robots. The new grant enables the team to develop sensors that can be integrated into robots capable of deploying themselves autonomously and boring underground with minimal disturbance to the soil and minimal operational intervention by humans on the surface. The robots will also be able to change locations and return to the surface for maintenance as needed. The robots will operate in wide-area subterranean sensing networks that will be especially valuable for evaluating the conditions of soils at sites where building foundations, dams, levees, tunnels, roads, irrigation systems and other infrastructure are to be constructed. The system will enable more precise agricultural practices, ground contaminant monitoring and other environmental health assessments. Other benefits of the system over current technologies would be more efficient below-ground geotechnical, biological and water studies and better predictive analysis of the vulnerability or resiliency of land to impacts from earthquakes or flooding. “An active underground wireless sensing network like the one we are proposing is basically nonexistent,” Tao said. There are a few sensing networks for underground applications but most use wired sensors, which makes installation and maintenance difficult. Wireless sensing networks without cumbersome wires and cables are gaining popularity for above-ground applications, Tao says, so developing these networks for underground applications is the next logical step to advance the technology. Achieving the goals hinges on the researchers devising sensor robots that can replicate the locomotive and penetrative capabilities of burrowing animals and plant life. Specifically, they want self-boring robots that can mimic what moles, worms, clams, plant roots and seeds do in excavating, digging and undulating their way into and through sand, silt, clay and the many other types of soils — and around the many subsurface obstacles. Multiple challenges stand in the research team’s way. Assistant Professor Daniel Aukes (second from left) discusses the design of a foldable robot with ASU engineering students (left to right) Roozbeh Khodambashi Emami, Mohammad Sharifzadeh and Azadeh Doroudchi. Aukes will bring his skills in robotics design and manufacturing and systems integration to a new project to develop networks of self-boring sensor robots for underground applications. The illustration depicts a schematic for applications of the underground wireless sensing networks being developed in the Signals in the Soil research project. Three applications enabled by self-boring sensor robots are precision agriculture, monitoring of soil contaminants and monitoring of infrastructure. The dashed lines indicate the traveling paths of self-boring sensing nodes. Assistant Professor Hamidreza Marvi (right) and ASU mechanical engineering graduate student Vidu Jayanetti hold a Basiliskbot, a bio-inspired robot for mobility in granular soil environments. Marvi will apply his expertise in bio-inspired technology, soft robotics and the mechanics of animal locomotion to pursue advances in underground robotic sensing technologies. Beyond refining the robotics and sensing technologies for such an undertaking, the project requires making robots capable of a range of burrowing techniques optimally suited to navigating in soil, Marvi said. The team must also clear hurdles that have so far stalled significant advances in below-ground sensing networks. Installation of current systems can require extensive excavations and keeping immobile buried sensors operating at peak efficiency is troublesome. Soils can cause energy dissipation resulting in degradation of the electromagnetic waves sensors use to transmit information, Tao said. This causes unreliable communication between a network’s sensing nodes. With self-boring robotic sensing nodes, the researchers expect to overcome those drawbacks with sensors that deploy themselves autonomously, thus alleviating the need for excavation. The sensor nodes can also change locations after being buried, providing a “dynamic” sensing network — in other words, a network able to cover large subterranean areas. Tao points out that the sensors will be capable of surfacing from underground for service and recharging. Sensor nodes will also be able to move closer to each other to improve data transmission reliability. The team will also formulate strategies for effective underground sensor signal transmission, the recharging of sensors, the actuation and control of the robots, and communication between all the network components. The researchers are also tasked with developing a rapid prototyping method to systematically design and fabricate the robots that will be adaptable in underground environments. The team will use 3D printing, materials science and soft robotics to find solutions using nontraditional materials, flexible elements and designs that enable navigation through granular mediums like soil and sand. That wide-ranging array of objectives is why Tao says he wanted specific collaborators who would bring multiple areas of expertise to the endeavor. Aukes has experience in robotics design and manufacturing and systems integration, which entails bringing together component subsystems into a whole and ensuring that they can function together. He directs the IDEA Lab — Integrating Design Engineering and Analysis. Marvi can contribute skills in bio-inspired technology, the mechanics of animal locomotion and soft robotics. He directs the Bio-Inspired Robotics Technology and Healthcare lab. Tao’s work focuses in part on soil behavior, bio-inspired sensors and smart construction technologies. He is on the team of the Center for Bio-mediated and Bio-inspired Geotechnics at ASU, a National Science Foundation Engineering Research Center known as CBBG. The mix of capabilities and expertise makes Tao confident the team can take a formidable step toward “revolutionizing” underground sensing technology that will have a significant impact on a range of scientific and engineering pursuits. The project will also provide hands-on experience and education for students. The NSF award provides $300,000 over two years, some of which will support the participation of two engineering doctoral students in the research. The team wants to bring undergraduate students into their labs through the Fulton Undergraduate Research Initiative and is planning education outreach that will bring first-generation college undergraduates and high school students from underrepresented communities to learn about CBBG’s research. Robotic technologies draw the interest of young students, Tao says, but his research project has the added attraction of “showing them all the things we are learning from animals and nature,” and why it’s valuable to preserve those sources of knowledge. Tao, Aukes and Marvi foresee underground networks of bio-inspired, self-boring robotic sensors revealing more secrets of nature that will inspire further efforts to push the technology toward new possibilities.